Metro is Southwest Ohio's fixed-route bus service, which serves Hamilton County residents in addition to providing commuter routes from Clermont, Butler and Warren counties into Cincinnati. Metro is a non-profit, tax-funded public service of the Southwest Ohio Regional Transit Authority (SORTA), providing about 14 million rides per year in the Greater Cincinnati area. Find answers to commonly asked questions on Metro’s FAQs. A regional system connecting our community with 20 million rides by 2021. 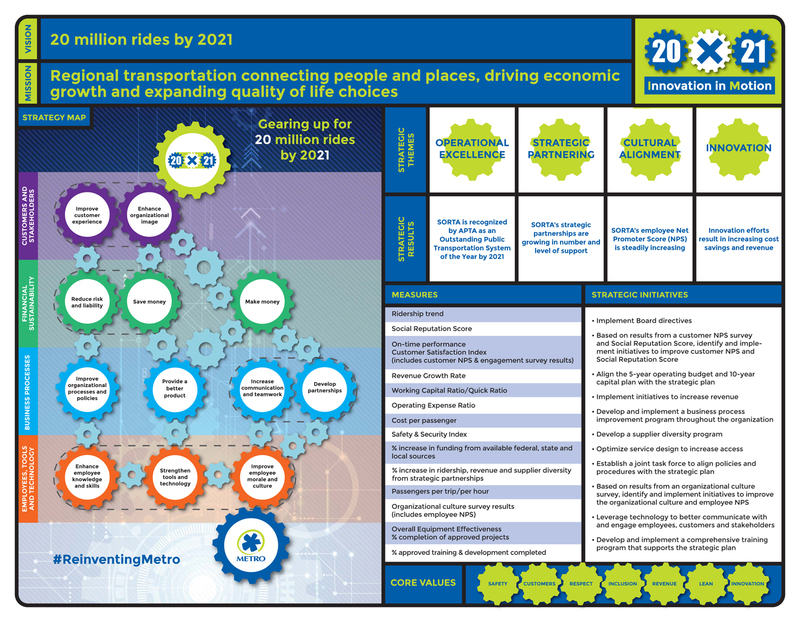 Regional transportation connecting people and places, driving economic growth and expanding quality of life choices. See SORTA's Ohio Open Checkbook report here. • Operates 365 days a year from approximately 4 a.m. to 1:30 a.m. each day out of two operating garages (Bond Hill and Queensgate). • Employs about 850 employees, most of whom are bus drivers and mechanics. • Currently 357 buses in Metro's fleet that drive about 11 million miles per year. Metro also owns 57 Access paratransit vehicles. • Offers 26 local-service routes, 19 express routes and 5 Job Connection reverse-commute routes. • Provides about 7,000 rides per day to Cincinnati Public School and parochial school junior and senior high school students on school days. We are very proud that the Governmental Finance Officers Association of the United States and Canada (GFOA) has again awarded a Certificate of Achievement for Excellence in Financial Reporting to SORTA for its comprehensive annual financial report for the fiscal year ending December 31, 2017, representing the 27th consecutive year the Authority has received this award. The Certificate of Achievement is a prestigious national award recognizing conformance to the highest standards for preparation of state and local government financial reports. In order to be awarded a Certificate of Achievement, a government unit must publish an easily-readable and efficiently-organized comprehensive annual financial report, whose contents conform to stringent program standards. The CAFR must satisfy both generally accepted accounting principles and applicable legal requirements. A Certificate of Achievement is valid for a period of one year only. We believe our current report continues to conform to the program requirements, and we have submitted it to GFOA to determine its eligibility for another certificate.